Harry and I have many happy holiday memories from our Portuguese Adventure. For me, though, our second Christmas stands out over all the others. We were members of the Igreja Evangélica de Algés at the time. Although Americans attended there, it was totally Portuguese in tradition and the congregation was amazing. Irmão Fernando Resina was one of the teaching elders. Our second Christmas in Portugal he and his wife invited us to eat supper with their family on Christmas Eve. The adventure began when I asked Harry what time we would need to be there. He said, “Around 9:30 p.m.” I’ve always been a morning lark, and that made me blink. But, such a delightful invitation, offered in love was irresistible. Before we left home on Christmas Eve, we had a snack around 6 p.m., and began to get ready to go. We borrowed the ministry van since it would be too late after supper to find public transportation. In addition, my tummy was feeling like I was coming down with the flu. We arrived around 9:30, right on time, but the party had not begun. (Later I learned that it in Portugal, generally “on time” can be up to 45 minutes after the hour of the invitation. The Resina children had put their boots by the stove for Pai Natal (Father Christmas) to put presents in at midnight. The tree was beautifully decorated. I learned that evening that, in general, Evangelical Christians had trees and Pai Natal who brought gifts; Catholic Christians had manger scenes, and the Christ Child brought the gifts. Around 10:30 p.m., our hostess called us to the table. 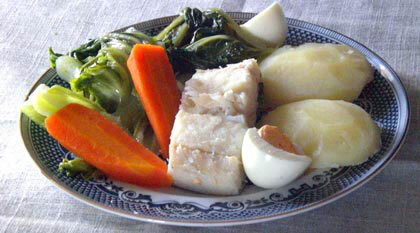 There was the traditional Bacalhau Cozido (boiled codfish). That included salted cod fish, reconstituted and boiled. There was cabbage, boiled potatoes, and broccoli on the side. It was my first Bacalhau Cozido, and I really enjoyed it. As we finished the bacalhau, family members began clearing the table. I was comfortably full, and it was around 11 p.m.
To my surprise, there was another course; the galo assado, a roasted fowl that had once upon a time crowed at sunrise. Salad, and homemade potato chips accompanied it. I had slowed down on eating, feeling fine and was hoping the flu had given up on me. 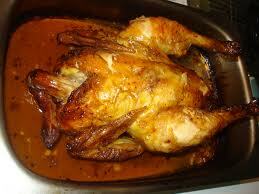 Following the fowl, bowls of canja (chicken soup) appeared on the table. It was delicious, but I couldn’t eat much. I was hoping that no one would be offended by my waning enthusiasm for food. And there was more. We were directed to the dessert table. 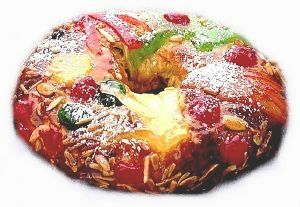 It was smothered with attractive sweets from rice pudding to Bolo Rei (King Cake). I’d never seen so many kinds of different pastries and puddings in my life. I nibbled a little here and there, and they were amazing. It was truly a feast fit to honor the King of kings. And no unhappy tummy all night. Around midnight the children got their boots, and opened their presents. Food, fun and fellowship ran riot that night. Soon after midnight, we got into the van and drove back across town to our neighborhood. Merry Christmas and a very Happy New Year to all of you. I look forward to sharing more about Portugal and our time there in January. Thank you and Merry Christmas. Much love to you, dear friend. Merry Christmas, Susan! I love traditions like that. Go for it, girlfriend. You just can’t always tell. Maybe Aslan will visit. We did. A great big noisy fun time. I hope you did, too. That Bolo Rei looks delicious, and the whole meal sounds wonderful. It seems growing up Christmas was more about fellowship and food, and a lot more memorable. Some of Charlotte and I’s favorite Christmas memories were the ones where we had no money left for gifts for each other, and so our Christmas was just a wonderful meal. I’d smoke a turkey and a ham, Charlotte would fix the sides, and we’d enjoy Christmas dinner together over candlelight. It sounds wonderful, your early Christmases. And this post still makes me homesick . Thanks for commenting. I hope it was a great Christmas. Happy New Year Susan! God bless you! Haha, Portuguese people are never on time, are they? I lived there for six months and many of the stereotypes were true, not for everyone of course, but most people. Sounds like a lovely Christmas. Happy New Year! Thank you for stopping by. We lived in Portugal, my husband from 14 years and me eleven. I loved it. If I had the chance, I would so return. Yes, it’s a lovely place! Of all the places I went when I was there I liked Óbidos the most, but for living I prefer Porto 😁 where did you guys live? Óbidos is a beautiful town. We visited up and down the country, but lived in several locations. I am editing a book that I need to finish today, so I will try to respond to your questions next week. Or, you can look over my posts on my blog. The blog is being revamped, but you are welcome to brows at your leisure.